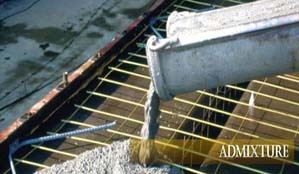 Concrete admixtures are added to enhance the working of concrete. The plasticizing action of our range helps to improve the appearance mobility and strength of the products. Our range can also be used for the reduction in cement without loss of strength. Further, these also have cement dispersing properties that helps in the greater utilization and hydration of cement. Bond - Aid Providing proper bond between old concrete and new overlays. A ready mixed polymer solution to be applied on concrete surface. 100 to 150 GMs/m² 20 Kgs. Ironite-R It is designed to add in production of machine & hand formed concrete products. Its plasticizing action improves the appearance mobility and green strength of the products. IRONITE “R” could also be used as cement saver to lower the material cost by reduction in cement without loss of strength or by increasing the strength with additional cement. Cement dispersing properties assists in greater utilization and hydration of cement and increased strength. IRONITE “R” is ready mixed solution and do not require any addition. Block, Slump bricks, Pipe, Tile, Split Blocks and per cast concrete. 2.5 to 4.0 oz of liquid to be mixed in 50 kg. Cement just before adding water. 20/50/200 liters. 6 months. Plasticizers Chloride free accelerating admixture. To accelerate the setting and early strength gain of concrete and mortar mixes without the introduction of chloride. 2 to 3 Kgs per 100 Kgs cement 5,20,100 Kgs carboys 12 months.